Compact size external sound card, compatible with smartphone, PC and laptop, and supports major mainstream live broadcast software, such as YY, Tik Tok, etc. 6 sound modes: Electro, Pitch Bend, Magic, Shock-Wave, MC, Dodge; 12 sound effects: Cheer, Embarrass, Gun, Despise, Debut, Kiss1, Laugh, Clap, Pay attention, Kiss2, Songs1, Songs2. With control knobs for microphone volume, echo volume, treble, bass, record volume, music volume and monitor volume adjusting. With LIVE1, LIVE2 and accompany instrument USB jacks; 3.5mm earphone speaker & headset output jacks; 3.5mm condenser mic & 6.35mm dynamic mic input jacks. 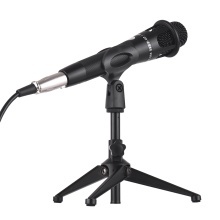 Comes with a condenser microphone, a microphone desktop tripod stand, a monitor earphone and several connection cable for professional network broadcast use.